Whisk together dressing ingredients in the bottom of a large mixing bowl: olive oil, olive oil drained from can of anchovies, lemon juice, parsley, oregano and black pepper. Fold the cannellini beans and the black olives into the dressing. Peel and segment oranges, removing any pith, divide each segment in half, reserving 4 segments and add to the cannellini beans. 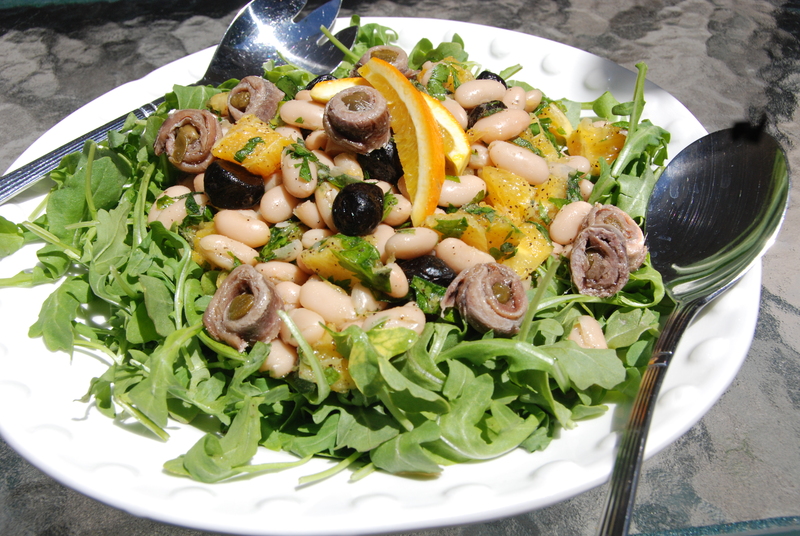 Divide arugula among four plates and distribute bean salad on top of arugula. 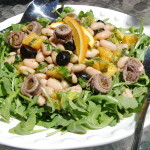 Divide rolled anchovies among the four plates and place a reserved orange segment on each salad. Drizzle any remaining dressing from the bottom of the mixing bowl over each salad. Serve at room temperature. * Rolled anchovies are anchovies that are individually rolled around a caper and packed flat in the can in olive oil. If these cannot be found, use a can of flat anchovy filets, chopping each filet in half and add 1 teaspoon chopped capers to the dressing. If making this substitution, add the anchovies and the capers to the dressing when it is made.